The Story of the Arrival of Our Deities! ~ The Toronto Hare Krishna Temple! The Story of the Arrival of Our Deities! 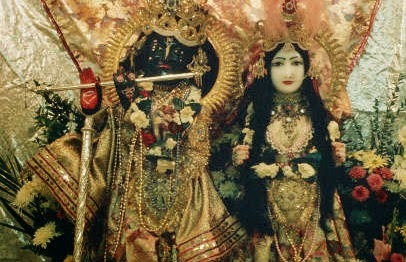 The presiding Deities of the Toronto Hare Krishna Temple are Sri Sri Radha Ksira-Chora Gopinatha (Radha Krishna), Sri Sri Gaura-Nitai and Sri Sri Jagannatha, Baladeva and Subhadra. Everything we do in our temple is a just a humble offering to the Lord and our Deities are the heart of our temple! Below, you can find the latest pictures of our beautiful Deities, information about darshan times and even the stories about how our Deities arrived in Toronto! We've recently updated the page on our website dedicated to our Deities and we've added stories about how our Deities arrived to our beautiful temple! Check out our new "Our Deities" page by clicking here! Agreed! We are very lucky to have such special Deities!